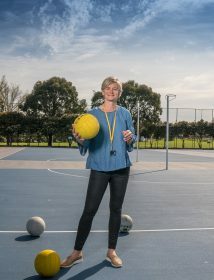 Netball is one of Sue’s greatest passion, both as a player, and a coach, usually of teams that include at least one of her daughters! She is co-author of My Incredible Netball Journal. Is it true that you often have to say to people“I’m not yelling! This is just my netball coach voice”? If you’ve been courtside with me you know that my style isn’t a quiet one! Every game I say to myself ‘Be silent, let the kids think for themselves’ but most games I fail. Perhaps I should tape my own mouth when on the side line! You were born in England but have lived in Australia for many years now. Who would you barrack for in an England vs Australia netball match? I barrack for Australia in netball (and every other sport!) as this is my home and has been for over the past twenty years. It is where I have had all my playing and coaching experiences. Plus, I know who the players are. What is the worst injury you’ve sustained as a netballer? Having a knee reconstruction was definitely the worst! Half my team are currently out through injury!! Should women over forty still be playing? we just love it so much! It’s your turn to pick something to read for book club.What book do you choose? A Rabbit! they are playful, fluffy and fun loving… even a bit nutty! Rabbits love nature and so do I. nature brings you back to centre when everything becomes too much.